Grace Church performs the Celebration and Blessing of a Marriage in accordance with the required canons of the Episcopal Church, using the liturgy found in the Book of Common Prayer. 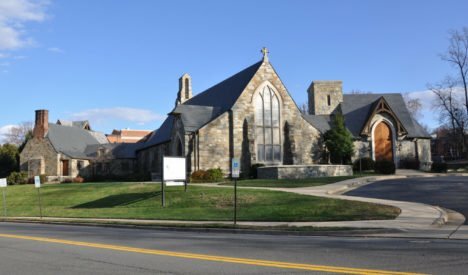 Who can get married at Grace Church? All active members and those exploring membership. The clergy are willing to counsel with those who are not members of the parish. In the Episcopal Church, at least one party must be baptized and there must be two witnesses. With the permission of the Bishop of Virginia, divorced persons who wish to marry again can do so, providing it has been at least a year since the divorce decree was issued. Grace Church clergy will prepare a petition to remarry after one to two meetings with the couple and/or the divorced person. How much notice does the church need? We recommend no more than one year and require at least six months. Be aware that the Church is not available for weddings during Lent and Holy Week (the six weeks before Easter); during Advent (the four weeks before Christmas); the second weekend of September, when Grace Church holds its annual retreat; and if there is another wedding already planned that day. Introductions, personal stories and biographies; why have you come to the church for a blessing of your marriage? Personal strengths and weaknesses; goals as individuals and as a couple; personal growth within and throughout marriage; what are your major concerns about marriage, self and one another? Communication, intimacy, sexuality; resolving differences; how do you share your love with one another and others? Faith in practice and belief; the place of Christianity in your lives; how do you understand God? The service for the Celebration and Blessing of a Marriage; the meaning of the Prayer Book liturgy; and understanding of the liturgy. There are several types of fees. Some are flat fees and others vary, depending on the choices you make. Adult children of Grace Church members, who were active members of Grace as children: Free-will donation. A deposit of the church use fee and 1/3 of the clergy fee is required to schedule a wedding. Another 1/3 of the clergy fee must be paid midway through the instruction process. All remaining fees are due in the parish office two weeks before the wedding. Fill out a marriage information form. Your wedding date will be placed on the church calendar after one of the clergy has agreed to officiate at your wedding and you have provided the required deposit to the parish office. Call the church office to schedule a meeting with the clergy. Meet with the clergy for 5 hours of pre-marital instruction sessions. Obtain a marriage license and provide it and your remaining fees to the parish office at least two weeks prior to the wedding.